The Shield is closed from February through mid-August for peregrine falcon nesting. The Knife Edge is open year-round. The Shield is truly a "rite of passage" at several levels of climbing in the Sandias. This is the biggest wall in the area and harbors some of the most difficult and long routes in the state. It is only open from August 16-Feb 28 or 29 every year for Peregrine Falcon nesting habitat, so you'll have to plan accordingly. The closure does not include the Knife Edge. Most climbs on the Shield are a very serious undertaking. You are very much alone here, like the Black Canyon of the Gunnison. There's no water, the rock is variable and much of the climbing can be run-out, especially on crux pitches. The rewards are high for summiting! This is one of the most beautiful places in the Sandias when the aspens change. The first climbing accident was logged on the Knife Edge of the Shield and most recently, a plane crashed just below the North Peak leaving shrapnel all throughout the oaks in 2007. To see another party on this formation might seem unlikely. However, because there is only a limited time that climbers can legally access these routes, the likelihood of getting scooped is higher than you might think. Access from the top: Park at the last switchback on the Crest Road. Hike the North Crest Trail to North Peak. This is easy to find if you keep peeking out over the limestone band. Descend the limestone band on a fairly beaten climbers' path. From about 1/2 the distance from the North Peak drop-off to the top of the Shield, start to bear back towards the southeast. Look for a few aspen trees in a gully where a static fixed line is tied off to a pine tree. Rap the line or rap your own rope(s). Drop down skiers' left for 10m and then cut back through a notch and contour across to find some hand lines several hundred meters from the rap station. This will gain you access to the Ramp and routes Smorgasboard to Procrastination. From the base: Park at Piedra Lisa Trail Head and plan for at least a 1.5 hour approach via the Fletcher "trail". To find the Fletcher Trail, start up the Piedra Lisa Trail. It will initially rise and then fall back into a creek bed. At this point veer slightly north (to the right and at a 1-20' slightly higher contour. The trail is very faint. You will pretty much think you are on a game trail. Follow this faint trail along a north-trending creek bed and toward the Rincon Ridge/Placitas until the trail begins to steepen. 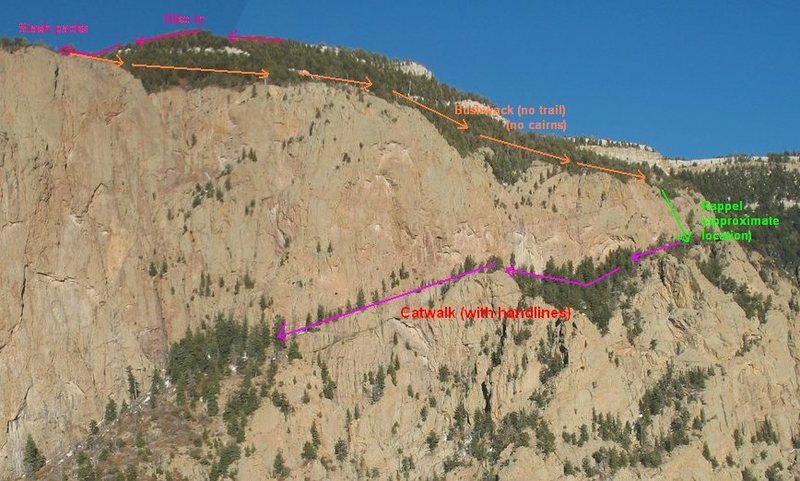 Look carefully for the Fletcher Trail as it gains elevation and eventually brings you the base of UNM Spire, and subsequently, the Shield if accessing anything from Procrastination or climbs farther to the right. For accessing the Standard "S" route and climbs farther left, it may be easier to gain the Rincon Spur trail (essentially the Knife Edge) and traverse in. Approach beta for the Shield, from the top. The base of the shield. The Shield in the evening light of summer. Access from the top? Looking at the topo, and all the great pictures we have thumb through, I have a pretty good idea where to go. What would be great is some sort of visual that details which gully has the rap station, and where the hand line crosses over to the primary ramp. "What would be great is some sort of visual that details which gully has the rap station, and where the hand line crosses over to the primary ramp."